Hey and hellooo! Thanks for answering my questions! Let’s start with the basics: do you remember your first musical experience? When did you start music and when found a ukulele first the way to your heart? Petty : My mother’s nursery song. Petty: Actually we started learning to play Ukulele when the Petty Booka project started. Booka: And now Ukulele is the only instrument I can play. obvious idea, especially in Japan, I can imagine. So – how was this ingenious idea born? This ingenious idea was born from Hiroshi Asada, our music producer. He is a promoter and has been brought lots of great musicians to Japan from 1970s, like Tom Waits. Is there any philosophy behind Petty Booka? 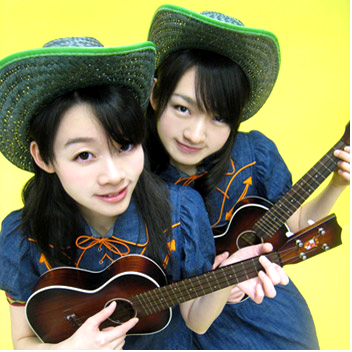 We (whole Petty Booka family, we and Audrey, Hiroshi and our band musicians) love American roots music and America. We would like to tell people how great all the singer/song writers and all the musicians are we have listened to. We did one once on the train. Yeah, we were invited to Dan Hicks Christmas show at Fillmore in SF and we sang with him! It was the most fantastic show we had ever. Team Petty Booka (Hiroshi and Audrey + some more people) choose all the songs we sing. Do you see still any challenges for Petty Booka? Hiroshi is starting collecting songs of canzone… maybe we need to learn Italian! about it, why did you wanna make it the way it is? our producer’s idea but we love bluegrass the best. What do you do besides your band? We do another unit called Duet, sing Bob Dylan songs. dreams and hopes you’d like to share?